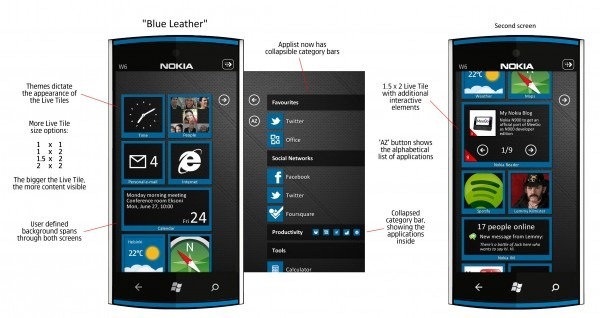 Scratching your head over what a Nokia UI on WP7 might look like? Worried by how much power Microsoft is giving Nokia to tweak the interface on the already beautiful Windows Phone 7? MyNokiaBlog has put together some fan renders of what it might look like, and you know what? They’re not completely hideous — and that collapsable app list is very cool! Some of variants are even kind of fetching. I still don’t completely believe that you can do better than the Metro UI, though. It’s a thing of beauty, despite the attempts of Nokia, HTC, et. al. to overhaul it. I like it, but it does need some work. I like the idea of being able to select a texture for tiles, instead of a color, but I don’t like the idea of a 1.5×2 tile. It’s very Symbian widgety, and it’s ugly. It breaks up the clean lines somehow. The ability to group apps in the app list is nice. The background… I guess it’s a nice option, but I don’t care for it. White and black are fine for me. I like the IM tile. I don’t like it, the original Win7 theme is much more better. They should try discussing something with Qt, not messing with the UI.